We got to Centennial Park a bit early, so we decided to wander around the EQ Village Markets at the Entertainment Quarters. 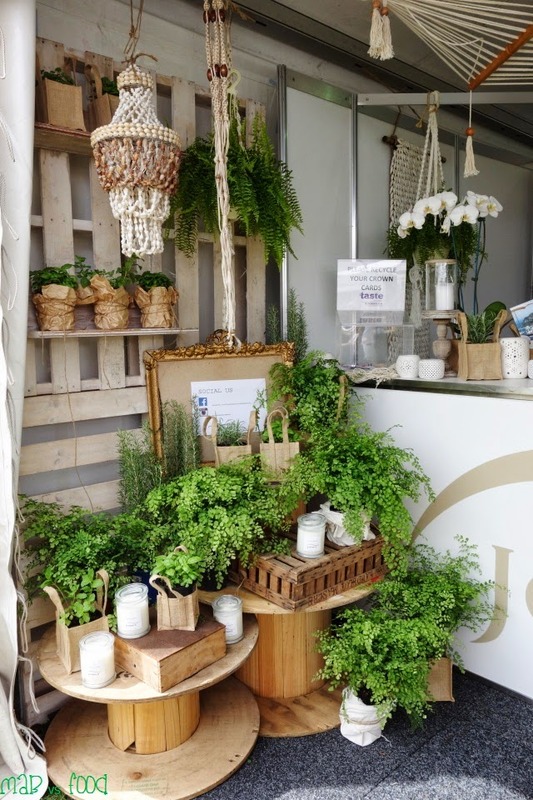 This was our first time at this fine producer market and after a quick browse around, we headed for Patisse, which as I will find out, is a slice of Paris in Sydney. Patisse is a cooking school in Chippendale and cater for events. It's a shame that they closed down their cafe, so the easiest way to try their pastries is at the EQ Markets. I was also slightly disappointed to find out that Frenchman and lady-charmer Vincent Gadan is no longer at Patisse (he is now at Via del Corso in Level 5, Westfield Sydney). The executive chef is now Aren Edye. Will the pastries be as good? Really, we had nothing to worry about! 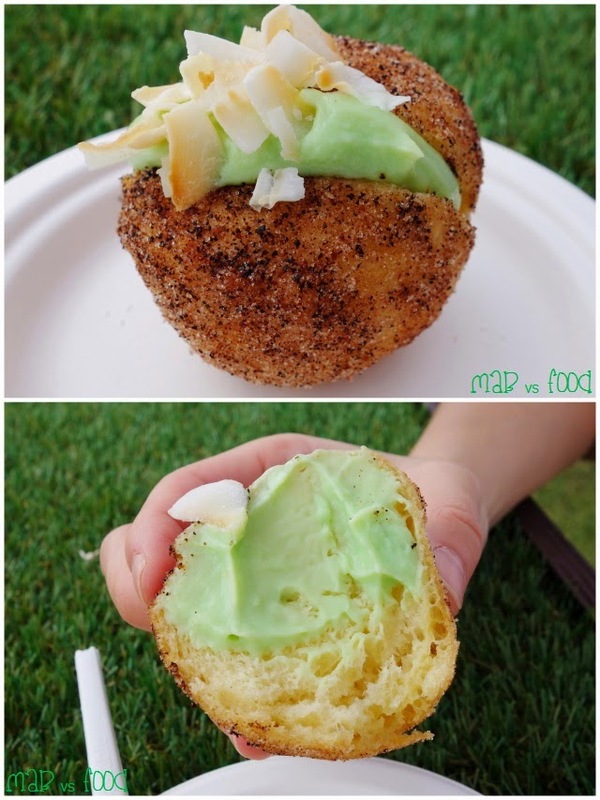 This savoury muffin was to die for! There was feta, pumpkin, spinach and corn. It was really moist inside, it was buttery, it was cheesy - we were salivating over it with each bite. 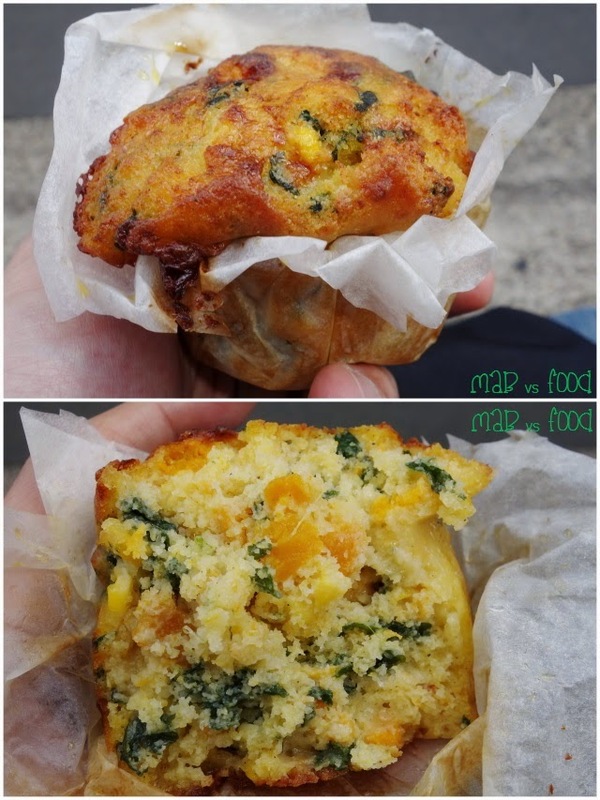 This was the best savoury muffin I have had in a very long time! 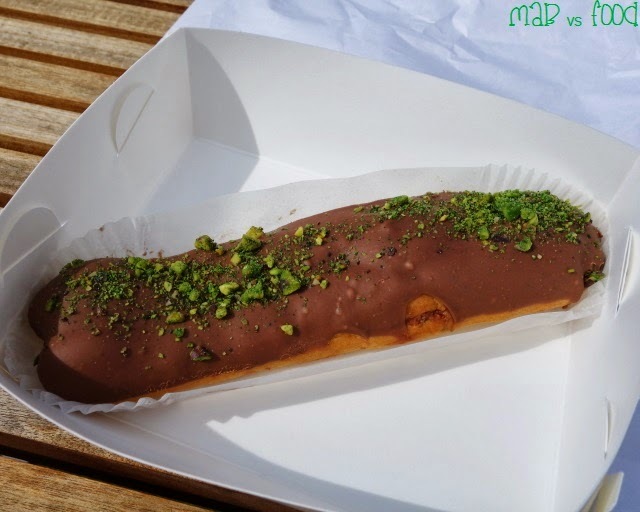 Another absolutely delectable pastry! 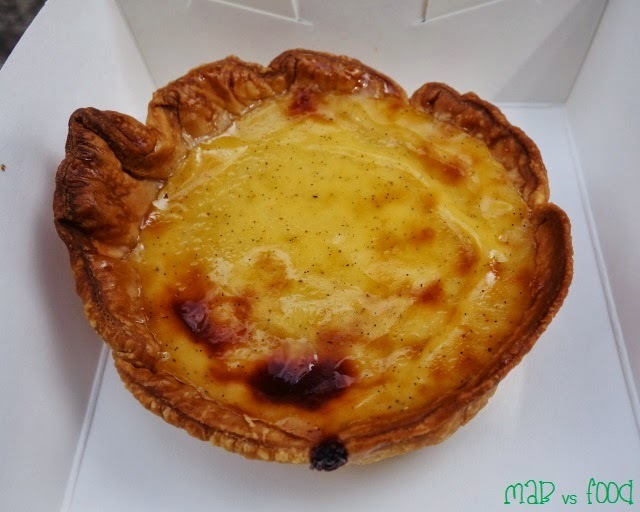 This baked custard tart was so delicious! The custard was sublime: smooth, eggy and loaded with vanilla. And the pastry was flakey and buttery. I could definitely eat several of these flans! 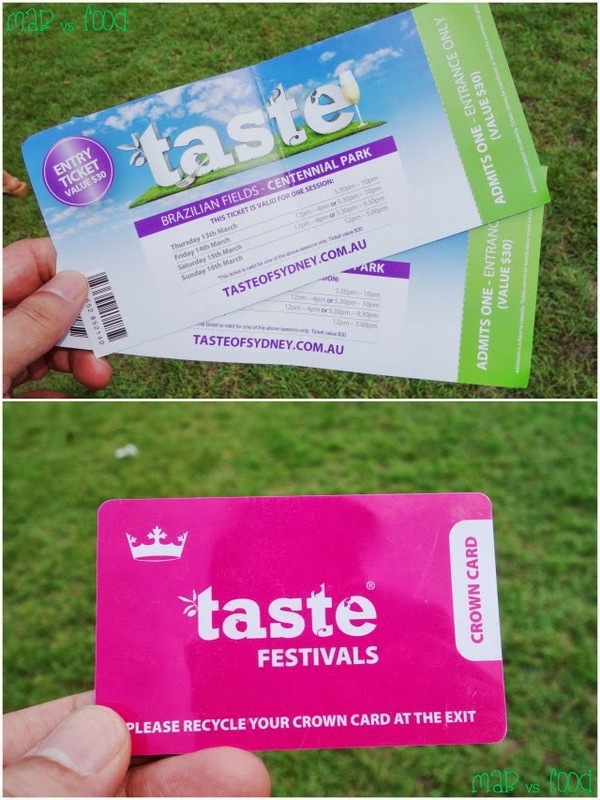 After our absolutely divine pastries at Patisse, we slowly wandered off to the Taste of Sydney visitors gates at the Brazilian fields. When we go there it had not opened yet and the staff resorted to rounding the crowds up like a herd of cattle rather than queuing. When the gates opened, everyone stormed in, empty stomachs and all and headed straight for the first food stall in sight. First stop for me, and conveniently located near the visitors entrance, was Colin Fassnidge's 4Fourteen / Four in Hand. Suckling pig is a signature of Colin Fassnidge (you will need to pre-order and a group of at least 10 if you want to have it at Four in Hand), so this stop was going to be all about suckling pig, as indicated by the pic above. 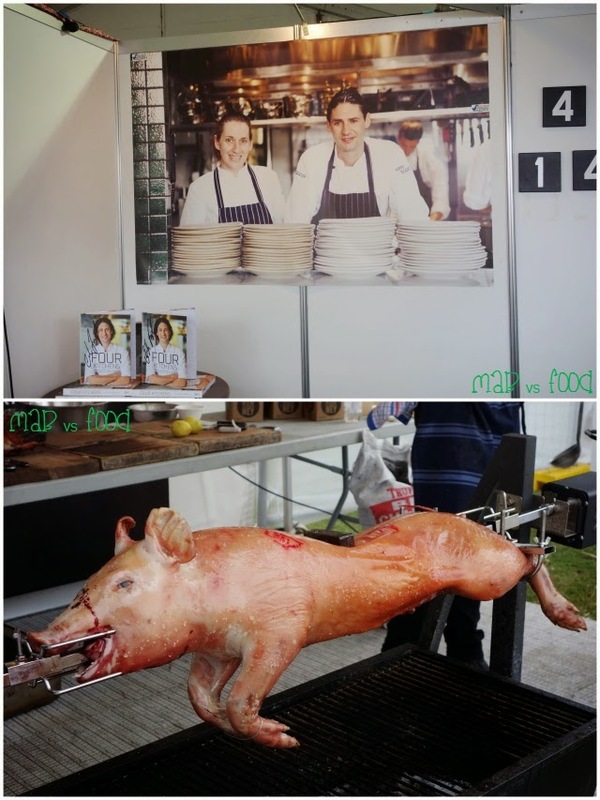 I did cringe slightly at the sight of blood dripping from the pig and its tongue wagging from side to side as the pig rotated on the spit. Not for the faint hearted! 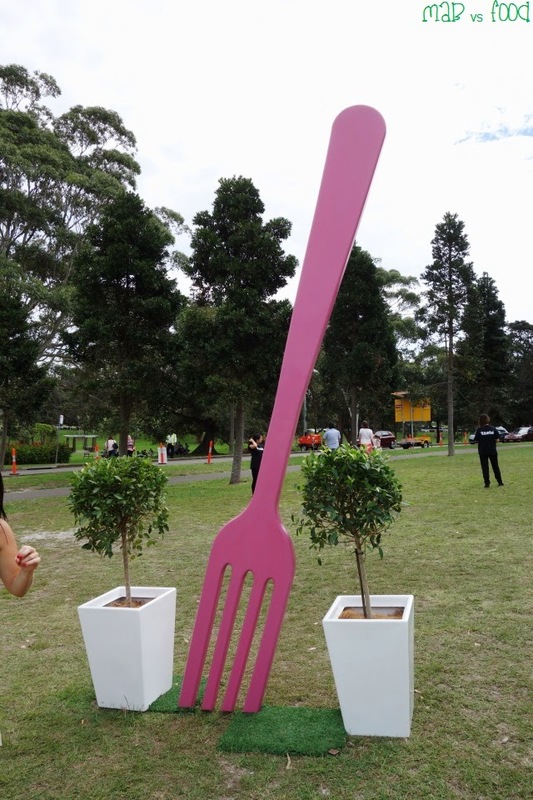 First of all, this was quite a sizeable portion for a dish at Taste of Sydney. Definitely a good one to share (obviously I couldn't given my wife is a vegetarian). The pork was really succulent and flavoursome. I enjoyed the meat strand by strand. Sharing the plate with the chunks of suckling pig meat was, no prizes for guessing, apple and a nice smoked potato salad. 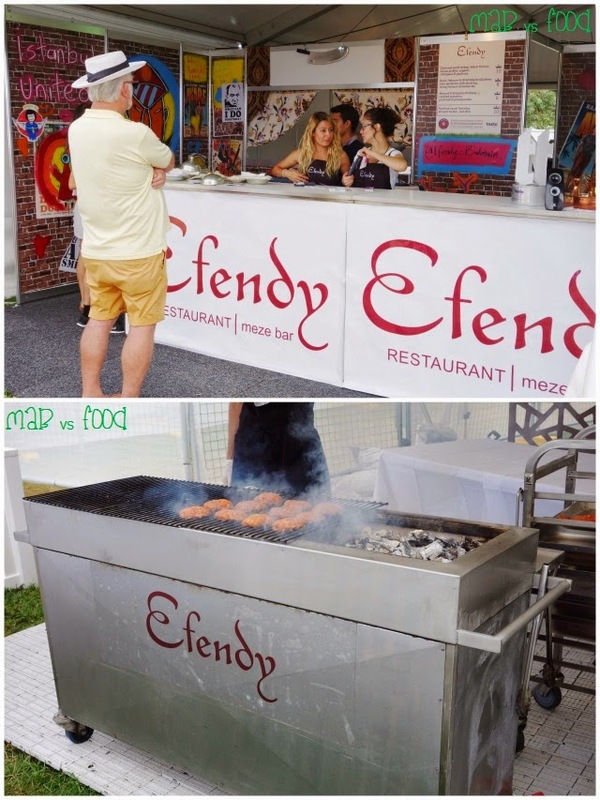 Next stop is Efendy, a popular Turkish restaurant in Balmain that I have never been to. When I saw lamb testicles on the menu I didn't know what to think. On one hand I was curious, and on the other hand I was slightly revolted at the thought of eating the gonads of a lamb. 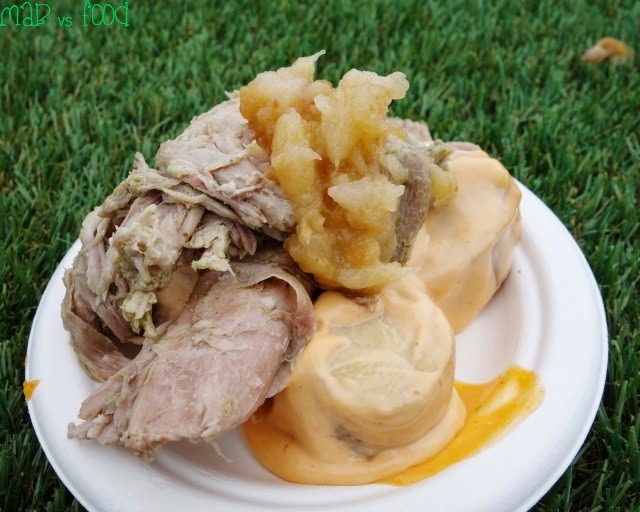 I like to think of myself as open minded when it comes to food, but lamb balls really test me. In the end I decided to take the challenge to see what they actually taste like, for the good of my blog. Whilst I was eating the lamb balls, my wife ventured off to Popolo (probably because she was grossed out at the thought of eating the testicles of another animal). 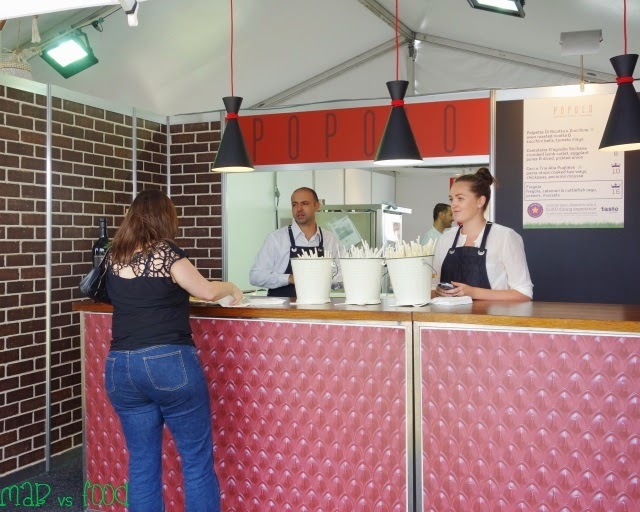 Popolo, a one-hatted Italian restaurant in Rushcutter's Bay, along with Aki's, are the top spots for vegetarians at Taste. 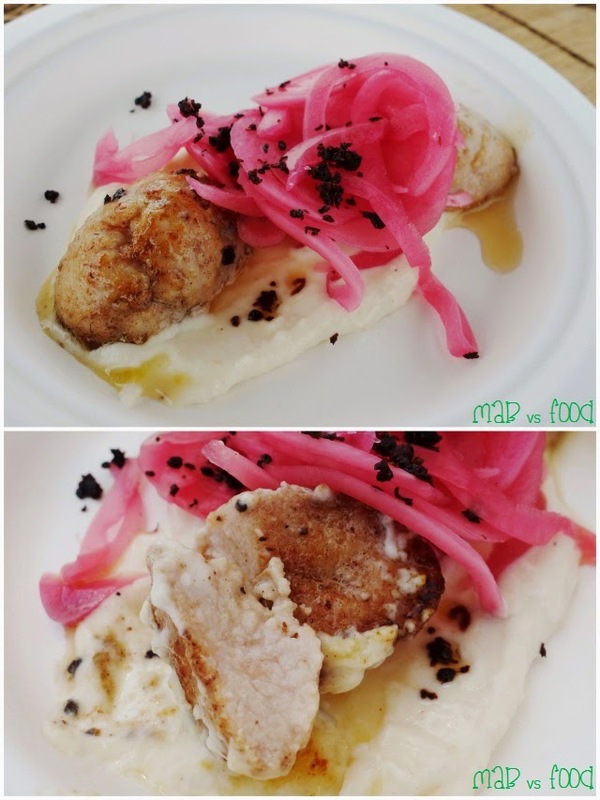 Popolo is always on my wife's list at Taste. I did not try any of this dish but my wife tells me that she enjoyed it. It came with 2 thick ribbons of pasta, one fried and once boiled. The pecorino mousse was yummy apparently. My wife's next stop was Jonah's of Palm Beach, which I have heard has the best views at a Sydney restaurant. Definitely sounds like a nice place to go for a special occasion. Jonah's wins the prize for most expensive dish at Taste with Jonah's 'Fruit de Mer' - oysters, kingfish, crab salad, confit salmon, king prawns, scallops (40 crowns). I know it has a lot of different seafood, but if I was going to spend this sort of money, I would rather do it at the restaurant. 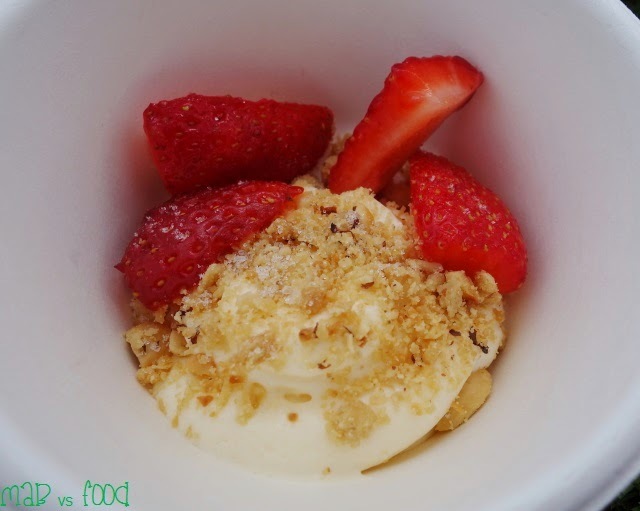 Any way, my wife decided to have their dessert option, buttermilk mousse, hazelnut & oat granola, strawberry & lime. This may have been a smallish serving given it was 6 crowns, but it was rather delicious. Who doesn't enjoy strawberry and cream? I am back at Porteno, but not the restaurant again (click here my previous Porteno encounter at the Sydney Cellar Door). 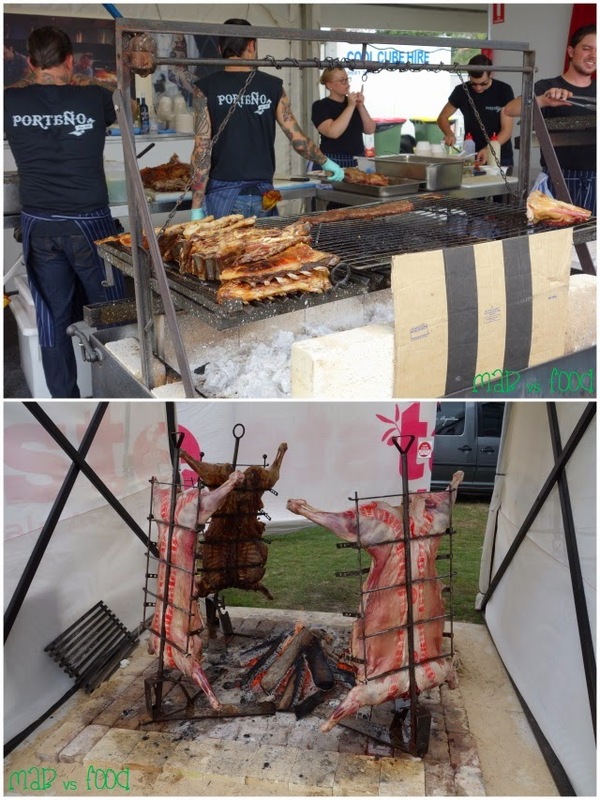 The tattooed chefs and owners, Ben Milgate and Elvis Abrahanowicz, were on hand to barbeque all kinds of animals. Pictured above are whole lambs cooking over a woodfire, which was a Taste Icon Dish weighing in at 20 crowns. I decided to go the wagyu skirt steak and I couldn't be happier. 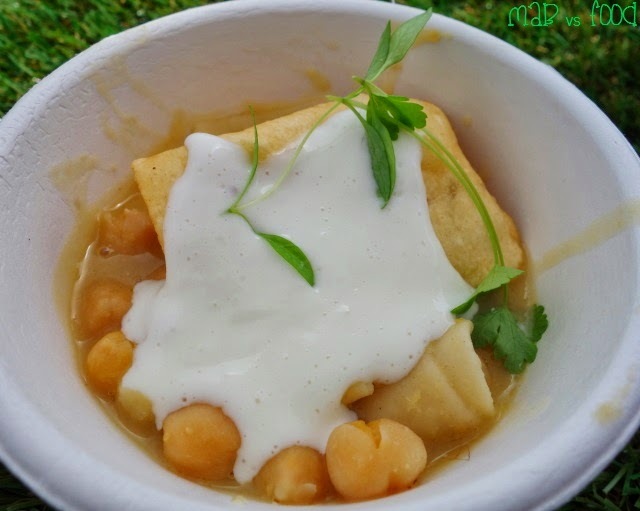 This was by far and away, the BEST dish at Taste of Sydney! I was absolutely blown away by the flavours of this dish. 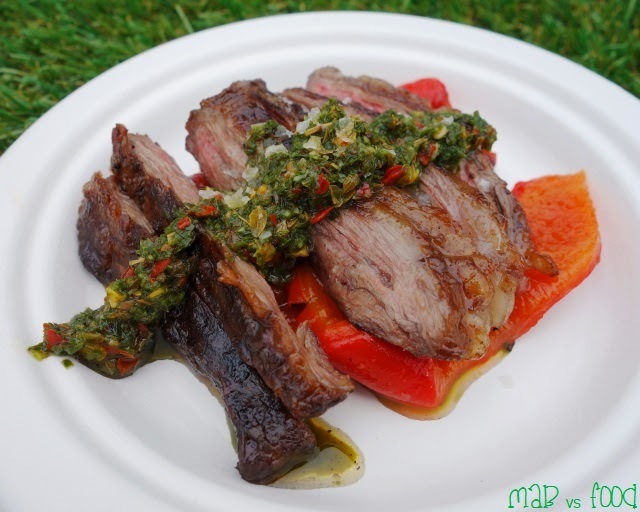 Combine skirt, which is one of the tastiest cuts of steak, with the spices from chimichurri and the soft and extra-sweet BBQ peppers, you have a dish that is just divine. I really ought to drag myself to the actual restaurant to get the full experience! Time for a drink break! My wife and I are big fans of sake and shochu, so we decided to stop by Sakenet, an online store selling sake and shochu (obviously). 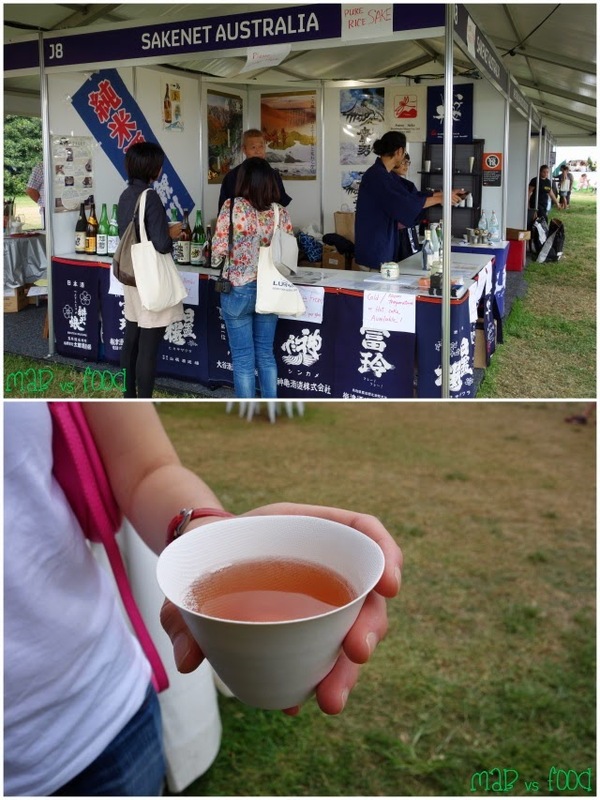 Fig sake (ichijiku Queen, Takaisami) is not something that we have tried before, so we decided to give it a go. I really enjoyed it and is something different from the more commonly used, plum. Definitely considering getting a bottle of this! Next stop is at Chow Bar & Eating House, which is a casual Chinese eats and drinks house occupying the old Bentley site in Surry Hills, to try the dish that was awarded Best in Taste by the critics, beggar's chicken. 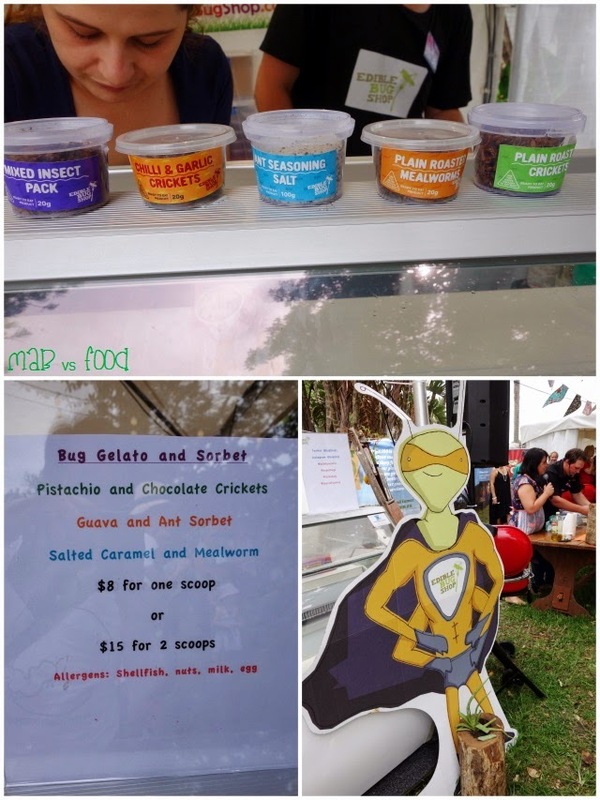 It was good to see Chui Lee Luk (ex-Claude's owner and executive chef) there manning the stall. 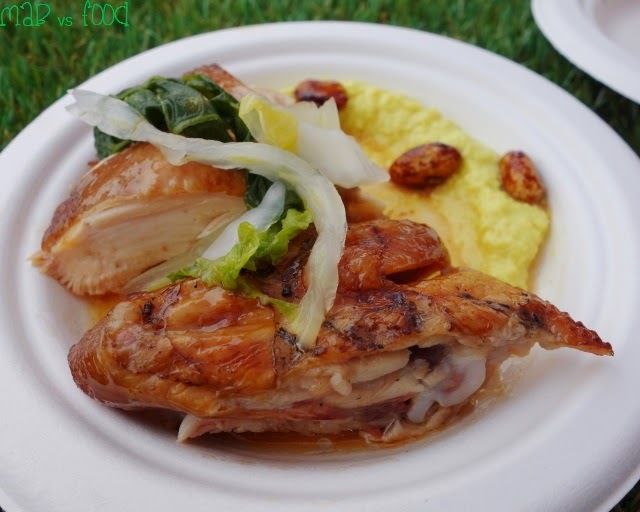 So was the beggar's chicken the best dish at Taste of Sydney? Probably not but it was pretty tasty. The chicken was moist, smoky and had nice spices. Sharing the plate with the chicken was pickled cabbage, red peanuts and a wonderful silken lemon tofu. My wife was intrigued by the sound of pandan & wattleseed doughnut. The doughnut came as a ball of fried dough that was filled with pandan custard and wattleseeds and sprinkled with cinnamon. The inside of the doughnut was nice and fluffy and the doughnut didn't taste too oily either. The pandan custard was not too "pandany" and really, really moreish. Yum! I am getting quite full by this stage and my search for desserts takes me to Edible Bug Shop in the Country Kitchen section for some gelato. Yes, that's creepy crawly ice cream! I am up for trying most things (including lamb balls) so why not! After listening to the shopkeeper explain the health benefits and flavour profile of bugs, I decided to go for the most "appetising" sounding flavour, pistachio and chocolate crickets. For some reason, I don't find eating ants to be particularly appealing. This was actually a really pleasant gelato! 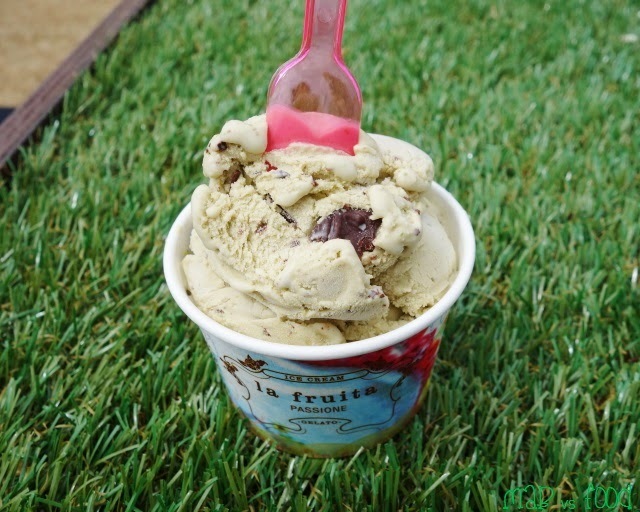 Pistachio is always a winner and the chocolate coated crickets were crunchy and had a nutty flavour. So that's all my stomach could fit! I was satisfied with the range of dishes that I got to try, especially Porteno's skirt steak, and as we were down 90 dollars, it was time to head home. 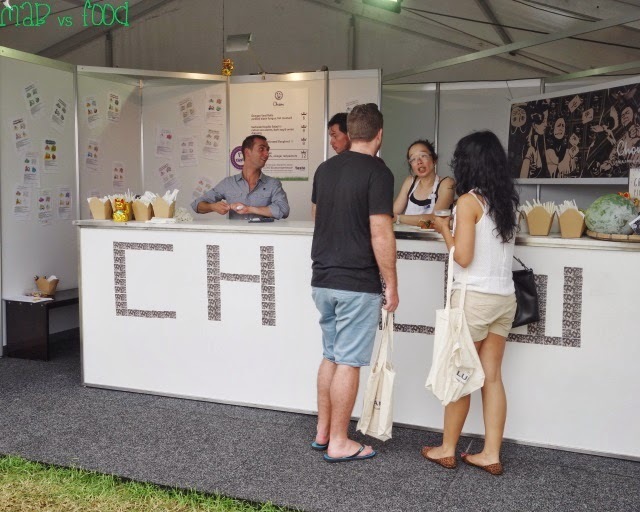 There were a number of dishes that I wanted to try but didn't get around to such as the hay smoked chicken legs from Biota (12 crowns), the wagyu rossini with shaved foie gras, truffle & Madeira jus from Chur Burger (18 crowns) and crispy king prawns from Longrain (12 crowns). Will need to use social media to find out more about those! 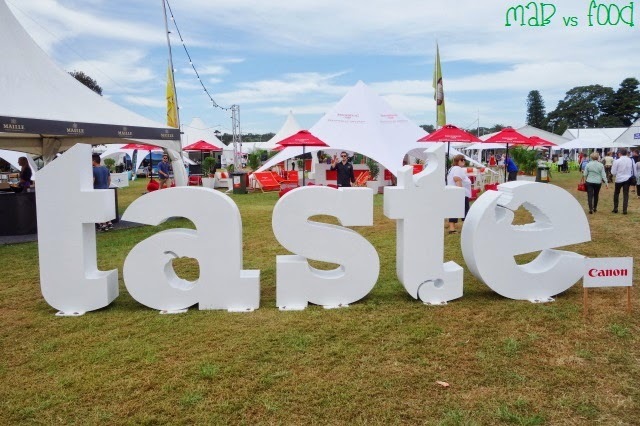 You might have noticed that this post was rather meaty as 95% of the dishes at Taste were meat-based. I would like to see a few more vegetarian options outside of desserts next year. But as Homer Simpson once said, "you don't win friends with salad", so I don't think this will change anytime soon.